Air purifiers have the ability to trap hazardous pollutants including Volatile Organic Compounds (VOCs), Particulate Matter (PM), Ozone, Carbon dioxide, Chlorofluorocarbons (CFCs) and unburned Hydrocarbon, which can cause several respiratory diseases such as asthma, Chronic Obstructive Pulmonary Disease (COPD) and infections such as influenza, pneumonia, tuberculosis and lung cancer. Rapid urbanization, burning of fossil fuels and increasing industrialization have intensified air pollution, which are stimulating the demand for air purifiers in India. In addition, rising income with changing lifestyle and declining prices of air purifiers have further fueled the growth of the market. The report thoroughly covers the market by air purifier by types, applications, and regions. The report provides unbiased and detail analysis of the on-going trends, opportunities/high growth areas, market drivers, which would help stakeholders to device and align market strategies according to the current and future market dynamics. • Historical and Forecast data of Global Air Purifier Market Revenue for the Period 2011-2022F. •	Historical and Forecast data of India Air Purifier Market Revenue for the Period 2011-2022F. •	Historical and Forecast data of India Air Purifier Market Volume for the Period 2011-2022F. •	Historical and Forecast data of India HEPA Filter Air Purifier Market Revenue for the Period 2011-2022F. •	Historical and Forecast data of India HEPA Filter Air Purifier Market Volume for the Period 2011-2022F. •	Historical and Forecast data of India Activated Carbon Filter Air Purifier Market Revenue for the Period 2011-2022F. •	Historical and Forecast data of India Activated Carbon Filter Air Purifier Market Volume for the Period 2011-2022F. •	Historical and Forecast data of India Ionic Filter Air Purifier Market Revenue for the Period 2011-2022F. •	Historical and Forecast data of India Ionic Filter Air Purifier Market Volume for the Period 2011-2022F. •	Historical and Forecast data of India Electrostatic Precipitator Filter Air Purifier Market Revenue for the Period 2011-2022F. •	Historical and Forecast data of India Electrostatic Precipitator Filter Air Purifier Market Volume for the Period 2011-2022F. •	Historical and Forecast data of India Air Purifier Market Revenue, By Other Technology for the Period 2011-2022F. •	Historical and Forecast data of India Air Purifier Market Volume, By Other Technology for the Period 2011-2022F. 12.2	Blueair India Pvt. Ltd.
12.3	Crusaders Technologies (I) Pvt. Ltd.
12.4	Daikin Air Conditioning India Pvt. Ltd.
12.6	Guangzhou Well Electronic (HK) Co.,Ltd. 12.7	Honeywell Automation India Ltd.
12.9	Panasonic India Pvt. Ltd.
12.12	Swiss Standard Co. Ltd.
India Air Purifier market is projected to grow at a CAGR of 37.6% during 2016-22 on account of growing air pollution resulting into increasing number of respiratory diseases and growing awareness amongst end users. 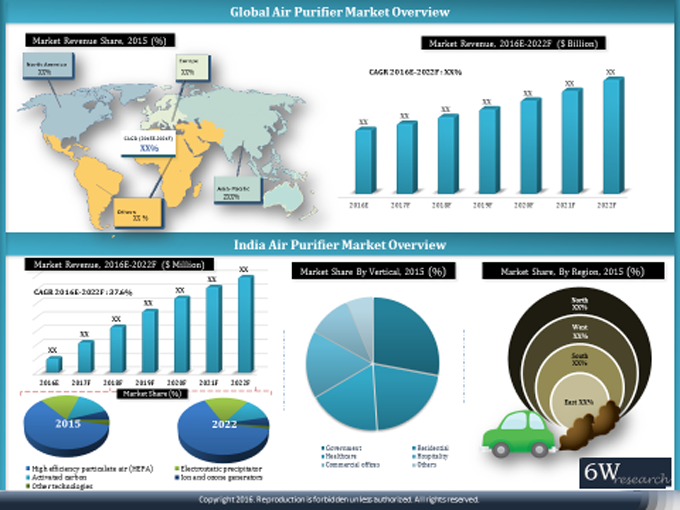 India Air Purifier market report has been segmented into air purifier filter types, applications and regions. The major companies in India's Air Purifier market include - Sharp, Blueair, Philips, and Eureka Forbes.